The following diagram shows a transformation graph used for parsing invoices generated by cell phone network providers. The size of these input files may be up to a few gigabytes, so it is very beneficial to design the graph to work in Cluster environment. 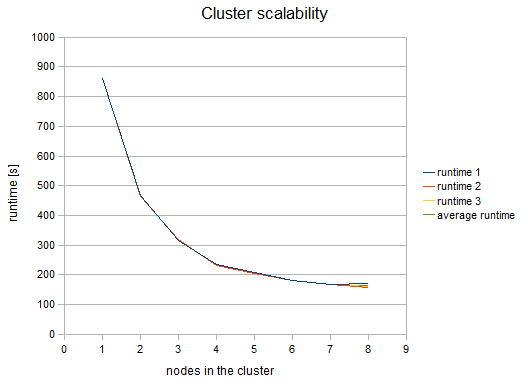 Note there are four Cluster components in the graph and these components define a point of "node allocation" change, so the part of the graph demarcated by these components is highlighted by the red rectangle. The allocation of these components should be performed in parallel. This means that the components inside the rectangle should have convenient allocation. The rest of the graph runs on a single node. The single node is specified by the sandbox code used in the URLs of input data. 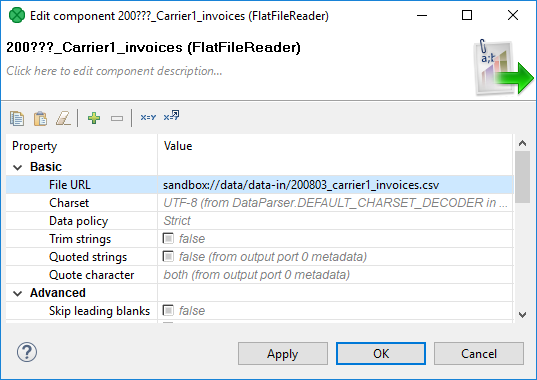 The following dialog shows the File URL value: sandbox://data/path-to-csv-file, where data is the ID of the server sandbox containing the specified file. And it is the data local sandbox which defines the single node. The part of the graph demarcated by the four Cluster components may have specified its allocation by the file URL attribute as well, but this part does not work with files at all, so there is no file URL. Thus, we will use the node allocation attribute. Since components may adopt the allocation from their neighbors, it is sufficient to set it only for one component. Again, dataPartitioned in the following dialog is the sandbox ID. This project requires 3 sandboxes: data, dataPartitioned and PhoneChargesDistributed. does not contain any data and since the graph does not read or write to this sandbox, it is used only for the definition of "nodes allocation"
components which run only on a single node, will run only on the i-4cc9733b node according to the "data" sandbox location. 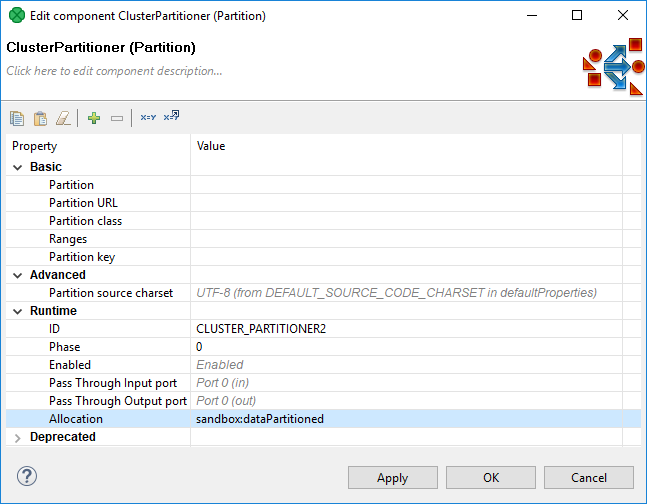 components with an allocation according to the dataPartitioned sandbox will run on nodes i-4cc9733b and i-52d05425. three executions for each "node allocation"
We tested "node allocation" cardinality from 1 single node, all the way up to 8 nodes. We can see, that the results are favorable up to 4 nodes. 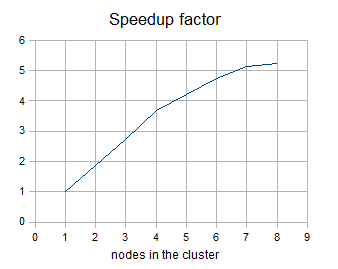 Each additional node still improves the Cluster performance; however, the effect of the improvement decreases. Nine or more nodes in the Cluster may even have a negative effect because their benefit for performance may be lost in the overhead with the management of these nodes. These results are specific for each transformation, there may be a transformation with a much better or possibly worse function curve.